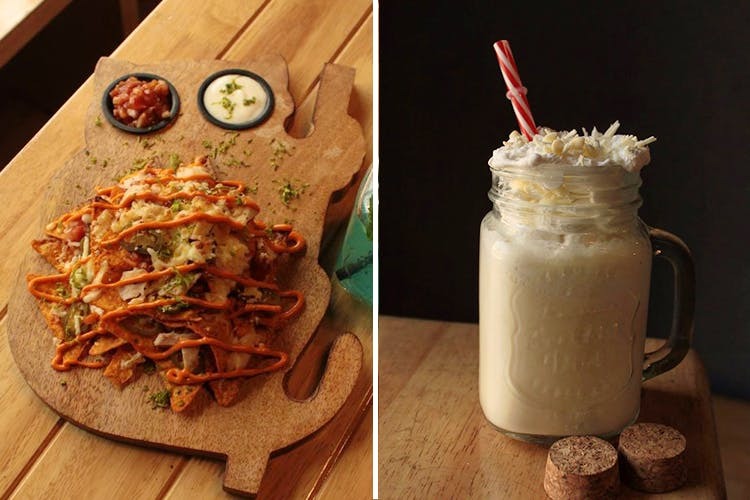 The Juice Bar and Cafe is a centrally located on Brigade Road with a menu filled with burgers, pizza, pasta and their signature milkshakes. Fresh juices from their juice bar and milkshakes, prepared the classic way and served in mason jars. You are in for a rich treat. Their milkshakes, interesting nibbles and their pizzas and burgers. Plus, their central location, right on Brigade Road. A chilled out ambience with hanging lights, long tables and even a football table — the cafe space encourages you to hang out at a lazy pace rather than dine and dash. Trick or Treat does an international menu with Indian options as well, so you have plenty to choose from. The appetisers have cheesy tortillas to baby corn tempura, and peri-peri chicken satays. For the main course, the pizzas come in three sizes, making it easier if you would like to choose more than just one. Try the seafood pizza or the Christina, which has eggplant, goat cheese and balsamic reduction. For healthier options, the salads are wholesome with delicious dressings. The fresh mint watermelon and feta salad is a balance of salty and sweet while the Southwestern Salad appeals to avocado lovers with a buttermilk ranch dressing. We are giving a thumbs up to Trick or Treat’s burgers also. The chicken Parmesan is crispy with a serve of homemade nachos, while the spicy fish fillet is served with jalapenos and gherkins. The milkshakes are what keep the crowds coming — from Oreo shakes whipped up with cookies and ice-cream to the Death by Chocolate, layers of chocolate blended to perfection using chocolate syrup, chocolate ice-cream and more. Other flavours include the Banana Blonde that has white chocolate and banana ice cream to Hazelnut and Chocolate milkshake, for the nut lovers. Their milkshakes are good enough to be called desserts. We are going back for their decadent milkshakes and their hearty burgers. Vegetarians, there are so many options for you on the menu and interesting ones too.